Another talent* that has recently started working at MCEC is Ellen Sterk (31). In 2018, Ellen won the AkzoNobel Graduation Prize for Chemistry and Process Technology. Within MCEC, she will work on ‘Support, Alloying and Promoter Effects and Active Sites in CO2Hydrogenation’. This research project has the potential to increase large scale applicability of renewably produced hydrogen and reduce the negative impact of CO2point sources. Where does your fascination for chemistry stem from? What will be your biggest challenge, working on your project? In the next four years, what is it that you hope to learn, develop, or explore? Do you see chances for collaboration with other MCEC PhDs or research groups? 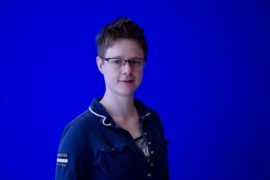 Ellen Sterk works at Utrecht University under the supervision of Bert Weckhuysen. You can find her profile page here. * See also this interview with Michael Jenks, and this post about the recent ‘meet & greet’ of new MCEC PhDs in Utrecht.